Thanks to the incredible generosity of the local community, St Luke’s Patient Comfort appeal has reached its target raising £32,000 to improve patient comfort at the Hospice. The donations will be used to purchase items on the Nurses’ Christmas Wish List for the Hospice, including 12 new bedside TVs, two pressure relieving mattresses, 12 rising and reclining electric chairs and new furniture for the conservatory. St Luke’s Medical Director Dr Andrea personally wrote to supporters in November asking them to donate to the Patient Comfort Christmas Appeal. She said: “We have been absolutely overwhelmed by the generosity of our supporters and can’t thank them enough. We know Christmas is an expensive time of the year for everyone, so the fact that the community has dug deep and donated so much money to our Hospice is just amazing. “This money will make a huge difference to patients here at the Hospice; we know how important it is for our patients to feel safe, secure, and comforted at an incredibly difficult time in their life. From a cosy bed to a relaxing chair, and even a TV to watch favourite shows and movies on; patient comfort is so important to us because for many families we meet, these will be the last days and moments they share with each other. The Patient Comfort Appeal launched just before Christmas to improve the comfort and care St Luke’s provide to patients. 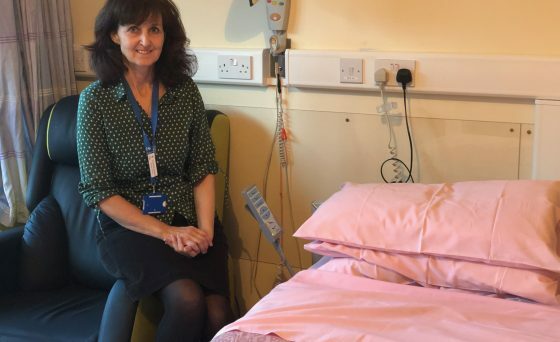 Dr Andrea’s plea has been answered and the new furniture and equipment will soon be purchased, enabling families to spend quality time with their loved one and make the most of the time they have together.